My husband and I have been amazed at the population explosion of Lady's Slippers (Cypropidium acaule) in our neck of the woods this spring. In past years, we'd be lucky to see three or four of the native orchids in the woods behind our house. This year, we've seen two stands of more than a twenty such orchids. It's New Hampshire's official state wildflower, but don't be picking it or digging it up in Massachusetts. 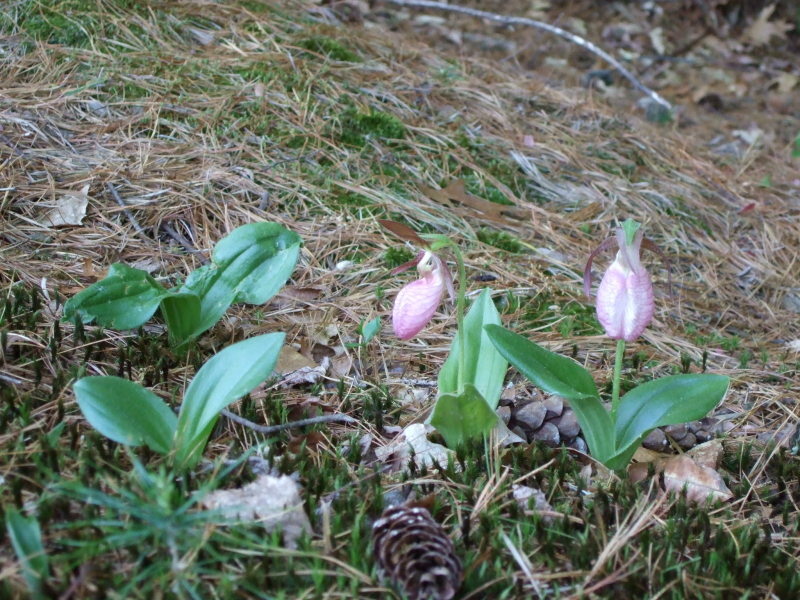 More coyotes and fewer deer and woodchucks, so fewer critters that munch on the orchids? Or is it global warming? I blame Bush! This exhibit sounds very cool: Art Goes Wild exhibit at Garden in the Woods in Framingham, MA. 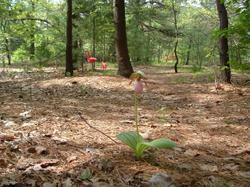 The exhibit marks the 75th anniversary of Garden in the Woods. Here are some pics from a gardener/blogger who went there last month. The exhibit will change through the season as plants fill in and bloom. "Never lose an opportunity of seeing anything that is beautiful; for beauty is God's handwriting -- a wayside sacrament. " The Boston Globe beat me to it. Today they published a listing of garden events and special plant sales for the Boston area. 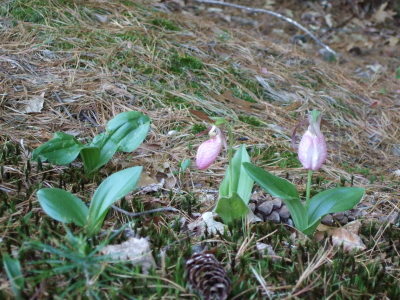 Their listing included Garden in the Woods, the headquarters and botanic garden of the New England Wild Flower Society. It's a beautiful wildflower center tucked away in Framingham, MA. Lovely place to visit, native wildflowers never looked so good. Their annual plant sale is Saturday, June 9th, 2007. The Globe also mentioned the Middlesex Conservation District Spring Plant Sale, which is Friday, April 26 (3-6 PM), and Saturday, April 27, 2007 (8 AM- noon) at the 4-H Fairgrounds on South Chemsford Road in Westford. Too late to pre-order, but you can show up on the sale days and purchase from a variety of plants, including bareroot evergreen seedlings, shrubs and trees, fruits, groundcovers and perennials. Very moderately priced, I've had great results with the shrubs. Sounds excellent. But if you crave herbs, you must go to Gilson's Herb Lyceum on Route 119 in Groton, MA. They have an amazing selection of herbs, over 300 varieties. They grow something like 20 kind of thyme alone. I'm not sure if they're even open yet, give them a jingle at 978-448-6499. The Herb Lyceum also hosts six-course herb dinners on Fridays and Saturdays, $50 per person, reservations required, BYOB. Their food is most delicious. "They have a unsurpassed selection of plants, many imported from China and Japan, that you won't find anywhere else. The owners care as much about leaf texture and plant form as they do about flowers. Plants are very reasonably priced. Perennial heaven! It's an unassuming, no-nonsense nursery with knowledgeable, helpful owners. I've been buying their plants for four years and have had only great results." Blanchette's opens on April 28, 2007. Corliss Brothers Garden Center and Nursery on Route 133 in Ipswich, MA comes highly recommended by a landscaper as a great source for shrubs and trees. Haven't been there yet though. Let me know your favorite garden shop or great little plant sale. Please share your info in the comments. 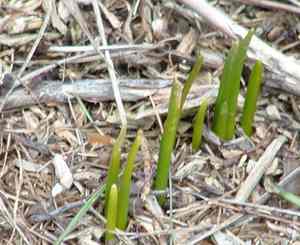 Some daffodils have started pushing their way up already. Spring returns with its new life, a good change from the deaths and aging we've been witnessing lately. Some critter has been nibbling, but apparently found it distasteful. Too bad the nor'easter slammed us tonight! The sprouts will be back though. 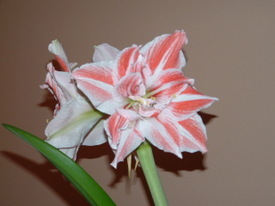 This crazy Amaryllis grew about four inches a day in the past week, no joke. Three flowers have opened so far, there's one more to bloom. 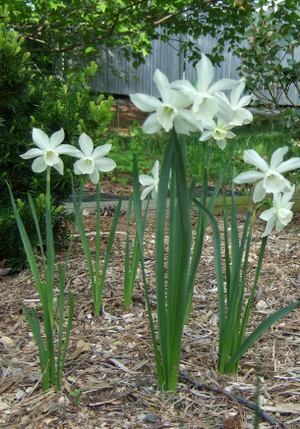 The flower measures eight inches across and sits upon a 30" stalk. It's called the Dancing Queen, and it would give Jack's beanstalk a run for its money. Next year I'll take time-elapsed photos for the week before Christmas! We are lucky to have lady's slippers (Cypripedium acaule) growing in the woods behind our house click to enlarge). And lucky too to have pink flamingoes back there as well. Real pink flamingos, manufactured in Leominster, MA, with a Don Featherstone signature, not those cheap immos made in Canada or China. Click to enlarge. 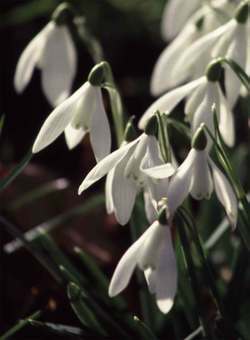 Early spring is a great time in the garden, every day, something new is peeking out. Nothing too showy right now (except for forsythia), just pretty little flowers springing up here and there.